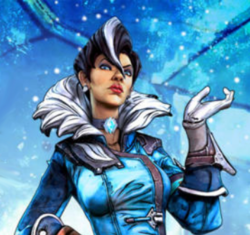 SPOILER WARNING: The second act of Borderlands: the Pre-Sequel! sees myself and Tracy tracking down an oppressed AI named Felicity, rescuing her (the AI identifies as a her) from her uncomfortable developer/boyfriend, and immediately betraying her to Jack. At the end of this cycle, Jack’s trajectory into villainy is almost certain. In my opinion, however, this is where the rising action stops. Jo is: Aurelia, literal ice queen and downloadable extra. She creates an ice shard that tracks enemies and does ongoing cryo damage. Tracy is: Wilhelm, cyborg henchman and a significant boss battle in Borderlands 2. He summons three drones, for attack, defense, and support. Here’s the thing about villainy: you’ve got to do villainous things. 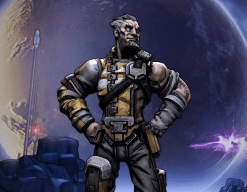 Throughout the course of Borderlands: the Pre-Sequel!, Colonel Zarpedon is the stated villain, and her plan of “punching a hole in the moon with a space laser” seems pretty villainous. But besides making the screen shake, and occasionally contributing to conversations, her acts of badness rarely affect you. We’ve been plunging through the storyline of the game — and admittedly, the average player would’ve been diverted into sidequests and exploration that would change the pacing of the narrative — but Zarpedon hasn’t done anything particularly bad to us. Zarpedon’s evil plan is to punch a hole in the moon. Why? Who cares! 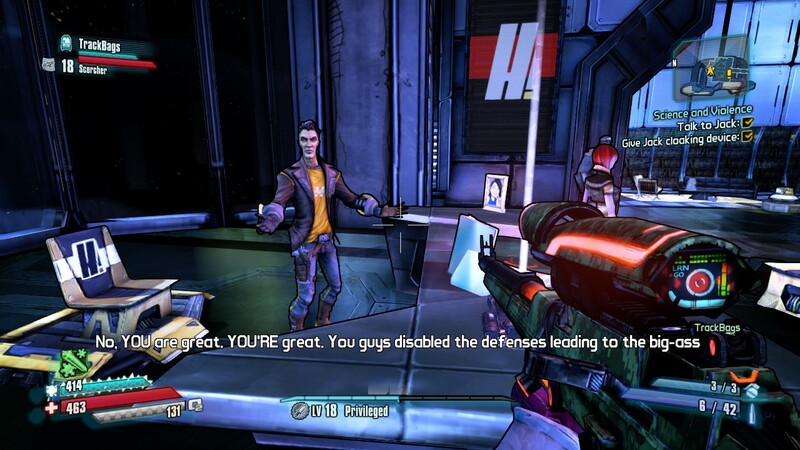 By contrast, in Borderlands 2, Handsome Jack is constantly sending robot armies after your character. There’s a quest where he tries to goad you into suicide. You engage with his villainy on the ground and often, in a way that you don’t engage with Zarpedon. Yes, yadda yadda, perhaps you are the true villain of the Pre-Sequel, etc. We’ll discuss that in part three. But to date, Tracy’s most involved moment in the plot was saying, “I don’t want to erase the nice lady.” Jack’s actions in the game are more impactful than anything Zarpedon does. Why are we working for this guy again? A good boss validates your mass murder. Borderlands also has a special talent of inspiring funny situations. Despite our best efforts, I’m still prone to rambling at length about the joys of the buttslam mechanic, and Tracy is still fully capable of finding new and exciting ways to die. Here’s a little clip with both! It also features incredible firefights. Tracy has improved a lot just through the natural course of play; the game engineers a variety of combat encounters so she’s become a good teammate and a better player. Tracy talks a bit about teamwork in our Q&A below, and you can see it expressed in our final boss fight for this session against a crazed Felicity in a robot constructor. Jo: The middle act of the game included some amazing set pieces, both in terms of badass firefights and beautiful backgrounds. In the previous games, Pandora was always expressed as a dangerous world to exist on, where random acts of violence happen all the time. How do you feel about Elpis in this regard? Is this a place where you’d want to live? Tracy: I love the contrast between the icy plains and lava pits, the stark blues, greys, reds, and browns. It does feel smaller, and bit more sparse to what I’ve seen of Borderlands 1 and 2. Elpis is a world limited by where you have breathable air, so I don’t have as much of an expectation of being attacked by bandits on this planet. There’s only so far you can go without an Oz kit. The main hub, Concordia, is odd. All of its citizens seem pissed off to be there. I think my favorite environment so far has been Springs’ hideout. Lots of little details on the walls, nooks and crannies to find secrets in. I wish it was the main hub of the game rather than Concordia. Jo: We’ve seen Jack change a lot up to this point in the game, and there’s been commentary throughout (by Lilith and some characters from the previous games) of disbelief. What’s your take on Jack’s narrative arc? Tracy: The game has really nailed “show, don’t tell” with Jack’s character arc. The commentary from the other characters is sparse enough that I get the point without feeling patronized. I love Jack’s subtle development of bloodlust, of egomania. His callous disregard of others starts with goons on Helios, then extends to the Merriff, then to a character I genuinely cared about – Felicity. Jo: By now, you’ve had way more time with gameplay, and I know you’ve been testing out some more first-person shooters. Have you felt yourself improving? Is this a genre you’d explore more? Tracy: I hope so! There’s this thing called “aiming” I’m looking to improve on as we progress throughout the game. I don’t think I’ll ever play something like Half Life or Doom, but there’s so much creativity in shooters that incorporate RPG elements, like Bioshock or Mass Effect. I’ll definitely be playing more games like those. Jo: Let’s talk quests! Our stream has mostly focused on the story elements of the game, but I know there are some quests that we’ve explored without an audience, or played with other people. Do you think you miss out on the game-game when you focus on the narrative-game? Tracy: Janey Springs’ sidequests felt well-constructed. She’s a character original to the Pre-Sequel so it makes sense she’d get a bit of spotlight. I love games with a ruined world, that have this eerie mood of “what the hell happened here.” I think the game assumes you already know Pandora is a horrible place, so by extension Elpis must be, too. There’s not as much world-building as I would like in the sidequests we’ve played. There’s also the anti-gravity thing again. Too much getting lost and running out of air takes away from me even wanting to do side quests in the first place. The deadliest enemy in Borderlands: The Pre-Sequel! is lava. And cliffs. Jo: I know: I’m not your only Borderlands bud. :< Have you had a chance to play the game solo? How does the multiplayer feel with other teams/characters? Is streaming a different experience from that? Tracy: Playing the Pre-Sequel solo vs. playing with other people is like night and day. My first hour on my own of the Pre-Sequel went like this – got surrounded by kraggons, ran away to try and escape, fell into the lava. It was awful! Multiplayer has been an eye-opening experience. Both groups of friends I’ve played with have had at least one seasoned player who knew exactly where to go, and what to do. (Shoot the kraggons! Don’t run away from them! They’ll follow you!) I find I don’t mind playing an extended game of follow-the-leader, especially when you arrive at major fighting areas. There are plenty of goons for everyone, usually a Badass or two as well. Anytime I felt left out of the game is more than made up for when there are dozens of Scavs to kill. Streaming has a similar sense of collaboration. We’re playing together, shooting bad guys together, falling in lava together. Gaming was a very solitary hobby for me growing up. The only games I played that were multiplayer were Mario Kart and the like. With streaming, I feel like I’m playing with a community. We are all connected in the great circle of Borderlands. Tracy Flanders: DC-based IT professional. Loves games, especially Bastion and Banjo-Kazooie, but mostly plays Netrunner like a pro. She sings soprano in the Washington Metropolitan Game Symphony Orchestra (http://wmgso.org/). 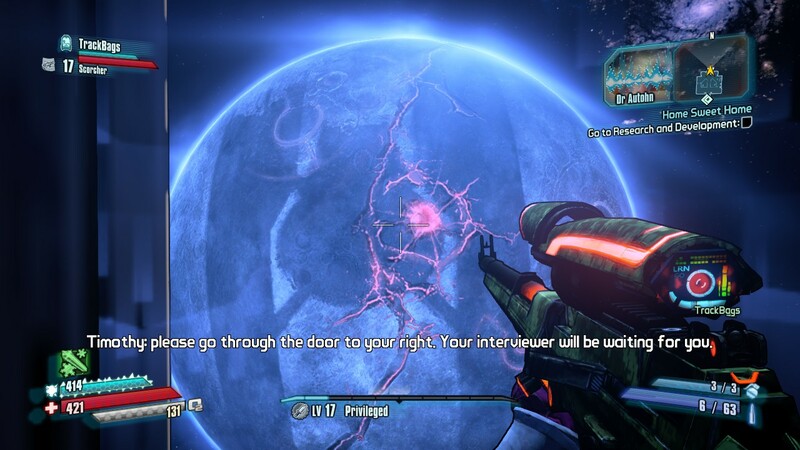 Read the full Borderlands: The Pre-Sequel Diaries series.